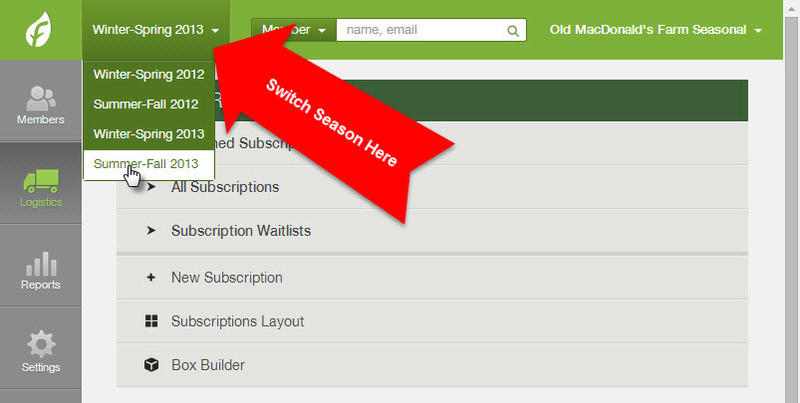 ​If you organize your subscriptions into seasons with a defined start and end date, take the following steps to set up your next season. ​Go to Logistics --> Season Management, Select "Create New Season"
2. Name your New Season. In the top right box type the season name as you would like it to appear (i.e. with capitals and spacing). 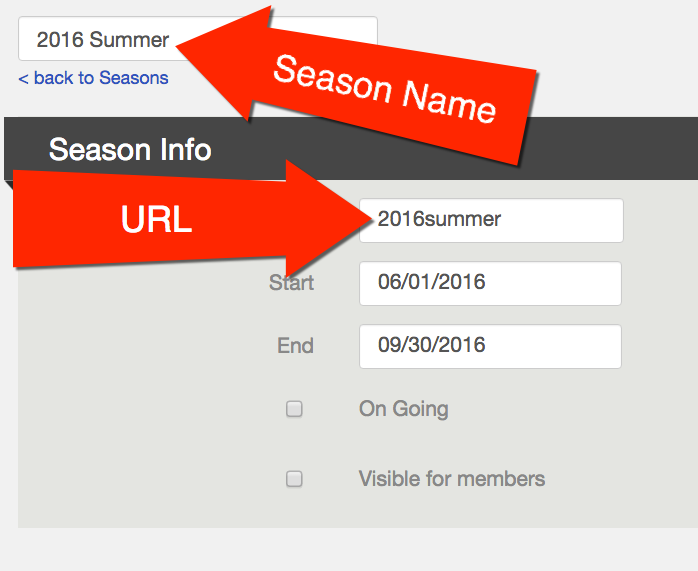 Under "Season Info" add the name of your season with no capitalization and spaces - this is your new season URL. Then set the dates of your new season. Leave "Visible to Members" unchecked for now, you'll select this when your season is ready for sign-ups, after you finish the steps below. 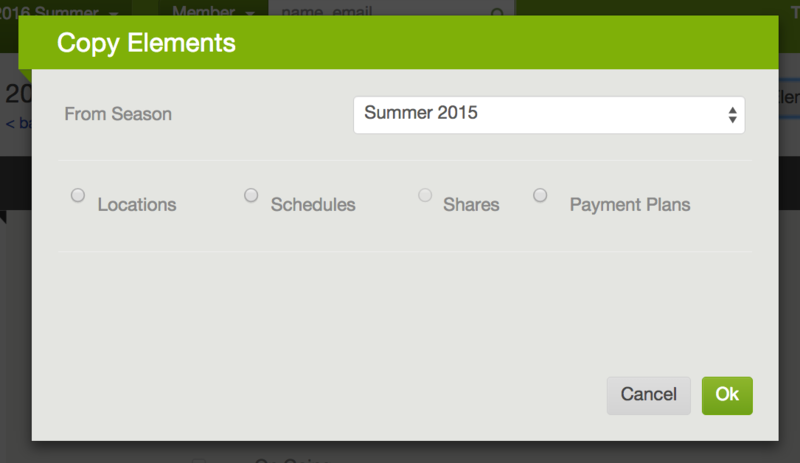 Leave the box for "Ongoing" UNCHECKED, this setting is not compatible with seasonal payment plans. ​Save your new season and you're ready to set-up schedules, shares, payment plans, and locations. You can copy schedules, shares, payment plans, and locations from previous seasons to your new season. Select "Copy Elements" in the right-hand corner. In the drop down select the season you'd like to copy elements from. You can only copy elements from one season, so once you choose the season to copy locations from, all of the elements will copy from that season. From left to right select each element one at a time, then select "ok". Complete for each element you'd like to copy. Schedules must be copied before Shares can be copied. We'll delete the season so you can start fresh. Complete Set up - Once your new season has been generated, complete the steps below to complete the set up of the new season. Post the new Join link to your website and start taking signups! Activate season when you are ready to start making deliveries. ﻿Before you launch your sign ups, please take the following steps to ensure that everything is set up correctly for your new season. As you are setting up different parts of your new season, make sure that the correct season is selected in the upper left corner of the dashboard. See image at right. Why are my locations greyed out? Go to Logistics --> Routes. Open up each location that should have a host and assign them to this location for your new season. This information is not copied between seasons. The content of your Automatic Alerts and Automatic Responses is the same for every season. Review the content of these emails regularly by going to the Settings page and looking at the sections for Automatic Alerts and Automatic Responses. 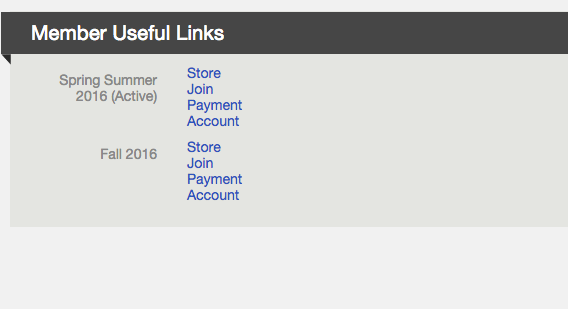 You can view your current and upcoming season links under Settings --> General Settings --> Member Useful Links. Open the new join link and go through each step of the sign-up process to make sure that everything looks good. If something needs to be adjusted, use the help links to learn about editing your schedules, shares, and locations. When reviewing the new join link, go to the Terms step of the signup process. If any adjustments need to be made to the Payment Plans listed in the Terms step of the sign-up process and if you have any questions, please contact support@farmigo.com. ﻿Make new season visible. When you are ready to take sign-ups for your new season, make the season visible to members. When a season is set to be visible, members can see and add this season when they log into their account. Update the links on your website, especially your join link, to start taking sign-ups!﻿ You can find the links for all of your seasons in the dashboard under Settings --> General Settings --> Member Useful Links. The system will accept sign-ups for your active season and new season at the same time, so you can post both links to your site when you are ready or one at a time. - Why are my locations greyed out in the sign up link? - Why does it say, "Our CSA is currently full. Please add yourself to the waitlist by selecting a share" in the sign up link?